I have been riding these for about 4 weeks now, mostly on hardpack and a little in the mud (at Forest to Falls). 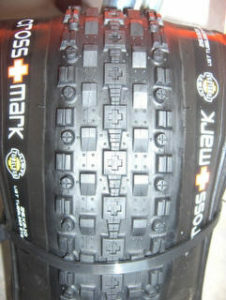 I have put together my views in this Maxxis Crossmark tyre review. These tyres are intended for XC racing, so straight out of the box you expect them to roll fast. And they do. They do roll with ease. I find them “slower” than running the foldable Larssen TTs but this is because the foldables are significantly lighter than these, almost 200g. Having said that, the new CrossMarks have a thing called LUST which stands for Lightweight Ultimate Sidewall Technology and what this means to you and me; is less chance of sidewall cuts, and it is in this department that I have been extremely impressed. With all the sort of “urban” mountain biking that most of us do in JHB and Pretoria, tyres can take a real beating with glass, rocks etc. I have not had any problems with the CrossMarks. I have heard dreadful pinching noised as I speed over rocks, but no flats. In fact, I have not yet had a flat with these at all. 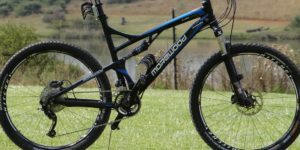 Maxxis CrossmarkWell if you have seen the Larssen TT and the Mimo? You will notice some similarities with the CrossMark. The side knobs are a combination of the 2 tyres but then there is a big square knob running down the middle. Think if the TT and the Mimo had a love child, but because they are cousins there is sort of an abnormality. Giving birth to the CrossMark. The big square knob has sort of a cross in it resembling the Swiss flag. The tyre was developed in conjunction with Christof Sausser. This was while he was riding for Siemens Cannondale last year, so ironically enough he will never be seen riding it as he can only ride the big S products this year. By their own admission the tyre does not corner that well. On the box they only rate it 2 for cornering out of 4 and rate it 4 for rolling resistance. But I find that the tyre corners very well. Over the last couple of weeks I have grown more confident and have really been whipping my bike in the singletrack and the tyres have not let me down. I am running them at about 38 PSI and this seems to be the sweet spot. Lighter riders can push it down to 35 PSI. I have also been impressed with the mud performance. Even though they are not intended for mud riding at all, I had them on at Forest to Falls and the mud cleared far better than the TT’s that I had on for Barberton and Haenertsburg. 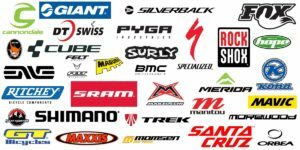 We will be riding these for the Epic this year. Yes there is a weight penalty over running foldables! But the puncture and sidewall protection are a must for the event. 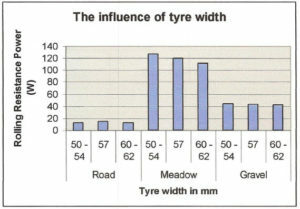 Oh, and they won’t break the bank, you can usually find them well priced vs other tyres!